Dr. Cook was on a guided fishing trip to the Nipigon River, Nipigon, Ontario when he caught the great fish. The Brook Trout was 14.5 pounds but what is not common knowledge is another 14.0 pound Brook Trout was caught the same day in the same rapids by R. j. Byrnes. 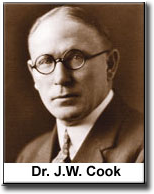 News Update - March / 2007 - Compelling evidence has come forward proving that Dr. Cook's Brook Trout was caught in 1915. Click Here !!! Click Here to listen to my interview about the World Record Brook Trout controversy on the Fish'N Canada Radio Show - FAN590 AM - Saturday mornings at 8:00 AM. Many people do not believe it's possible for a Brook Trout to get that big. Some were saying it was a Splake, which is a cross between a Brook Trout and a Lake Trout. The Royal Ontario Museum of Zoology in Toronto did examine the fish and certified it to be a genuine pure bred Brook Trout. I myself had a hard time believing it until I found out they are pulling 9 and 10 pound Brookies out of lakes in the Nipigon and Wawa area, and in present times, so an extra 4 pounds in 1915 is not a big stretch. Plus in 1915 there was next to no pollution or fishing pressure. Also, "a Coaster", which is a Brook Trout that lives in Lake Superior, were much more common in 1915 and these Coaster Brook Trout where well known for becoming huge with many moving up into the Nipigon River throughout the year. Pulp and paper mills killed off many of the Coasters but the population is making a major recovery thanks to conservation efforts by the Town of Nipigon , fishing clubs, the Ministry of Natural Resources and local industry. 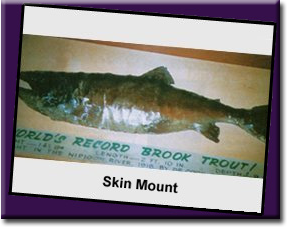 Dr. Cook's World Record Brook Trout was most likely a Coaster Brook Trout.